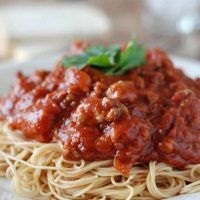 Italian Turkey Sausage and lean ground turkey are the main ingredients in this simple slow cooker meaty marinara! Nothing beats an easy dinner that’s ready when you need it! There was a time that I loved to run. I think that time was between the ages of 5 and 10. During that time I ran everywhere! I ran to my friends house, then I ran home. I ran to school and I ran during recess. I ran up the stairs and I ran down the stairs. I ran playing tag and I ran playing chase. I ran and ran and ran and never seemed to tire or get winded. By the time I got to high school, not only did I hate running, but I found it difficult to do. It only got worse with age. Today, the only running I do consistently is to “run errands”. Running seems like the most natural thing to do. After all, it requires no special equipment and it can be done anywhere. Yet, for some of us it feels like the most unnatural thing possible. Giving birth (3 times) is by far an easier task for me than running a mile!! How did this happen? Am I just out of practice? Old lungs? I want to run, I really do. 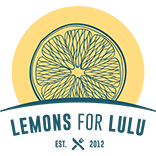 I recently uploaded an app that is supposed to get me to run a 5k in 8 weeks! Sounds easy doesn’t it? I’m not actually going to run a 5k (that would be crazy). I just want to experience that exhilarating freedom that comes from running as fast as you can. I want to feel my heart pounding and hear my feet against the pavement. Yes, that’s exactly what I want. In a large skillet over medium heat olive oil. Add onions and garlic and cook for about 4 minutes or until onions have softened. Remove to slow cooker. In same skillet, heat ground turkey and turkey sausage. Stir in basil, oregano, thyme and salt. Cook until turkey is crumbled and no longer pink. Add meat to onions in slow cooker. To the slow cooker, add canned ingredients, vinegar and sugar. Stir. Heat on high for 3 1/2 hours. While I’m not doing marathons just yet, I can eat dinner like I am right? 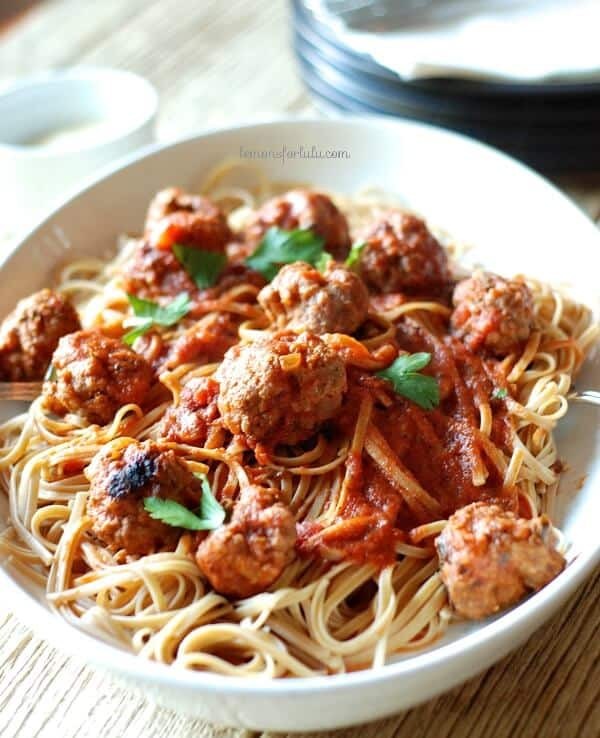 Since pasta is the meal for us runners, I came up with this flavorful, meat-filled marinara. Nothing is more comforting and satisfying than a big, steaming bowl of pasta smothered in an aromatic tomato sauce! This meaty marinara is filled with Italian turkey sausage, ground turkey (keeping it on the light side), garlic and herbs! Aside from the taste, the best thing about this sauce is how easy it is! Brown your meat and toss everything in your slow cooker! Dinner is ready and waiting when you need it! 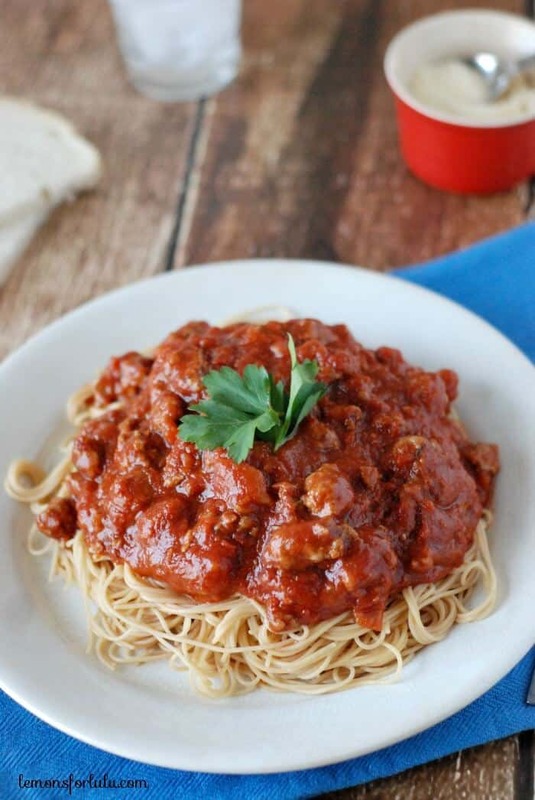 I love slow cooker meals, especially pasta sauces! I hate running but I’d run over to your house for a big bowl of this pasta that’s for sure! P.S. Running outside is way easier than on a treadmill. Why I have no idea, but that’s I found! I hate running outside because then you have hills! I’m too embarrassed to run outside! But you can, all the way here! Cool! Looks super easy to make! 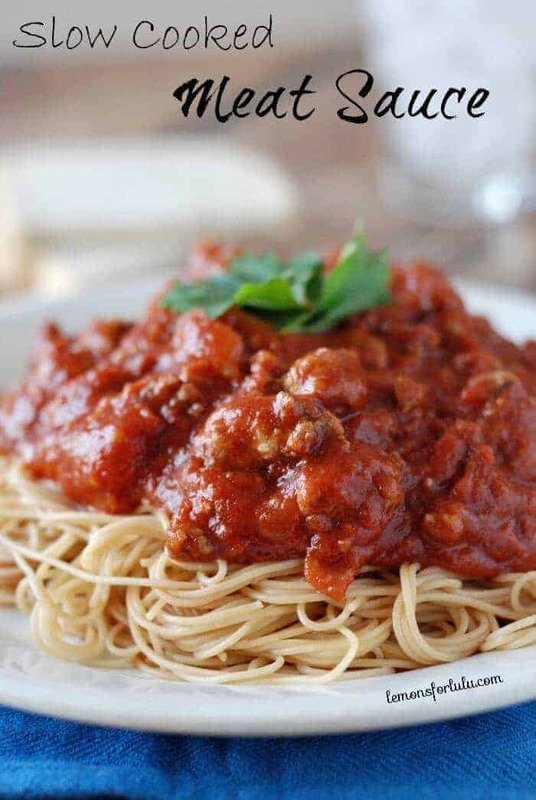 I LOVE homemade spaghetti sauces and this one looks great! Is there anything I could replace the balsamic vinegar with? I’m not a fan and wondered what I could use instead. You could certainly leave it out or increase your brown sugar. Why have I never done this? 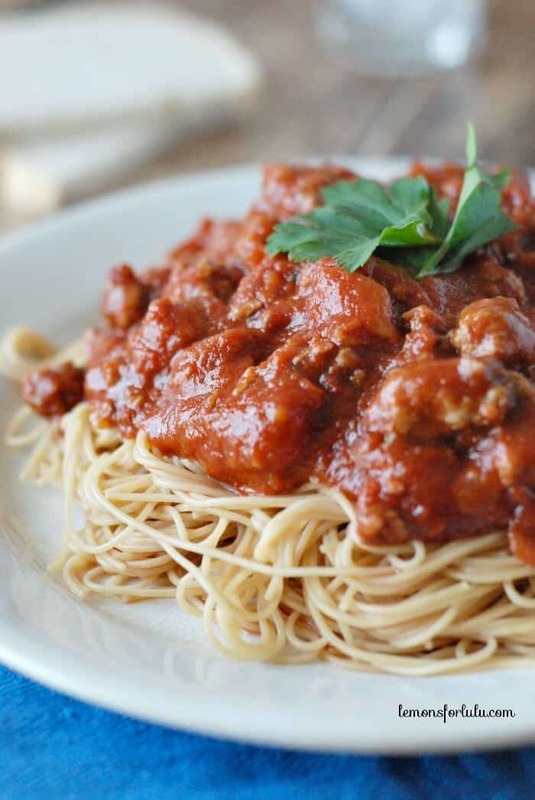 Meat sauce takes a lot of time anyway, why not just pop it in the slow cooker? This has been a glass-shattering moment for me. Oh, this looks delicious. I’ll have to try making sauce in the slow cooker sometime. It never crosses my mind. Takes out all the work. I love my slow cooker! I need to add this to the menu for this week! Thanks for linking up with What’s Cookin’ Wednesday! I am definitely not a runner, but I run every day. Ha! I just don’t love it like I wish I did. 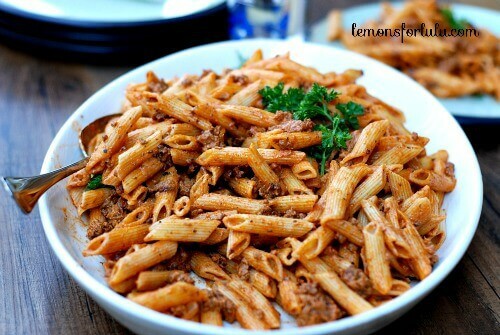 Oh well….the more I run, the more of this yummy pasta & sauce I can eat! I’m running over to your place to eat a giant bowl of this!! YUM!!!!!!!! This is SO good, Tanya! I made it in my pressure cooker last week (add 1/2 cup liquid and bring to pressure, cook 10 minutes) and we all loved it. Tasted like it had cooked all day. I’m having friends over for a newborn photo shoot today and making this again. Very delish! Thanks for sharing your recipe. So glad my pressure cooker could take over in a pinch! I was skeptical that this would taste too “healthy” with ground turkey, lean turkey sausage and only 1 tablespoon of sugar for the whole batch, but I was wrong! It was absolutely delicious. We ate half and froze half for a quick supper down the road. Served with whole grain pasta and a sprinkle of parm! Thank you for this quick, filling and delicious recipe! I love freezing this recipe; it tastes just as good when you serve it up the second time. I’m so happy you enjoyed this recipe! My family loves this recipe and whenever I need to bring food to another family (for new moms or sick families) I bring this one. Thanks so much for reading and trying the recipe.